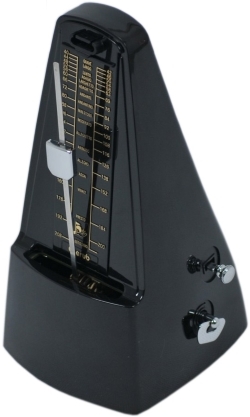 Metronomes are like an auditory form of Chinese water torture to some, but they are an indispensable tool in developing good timing and increasing speed. There are a number of ways to make your metronome drills more engaging, efficient and rewarding, which is what this article is all about. The question of how to use a metronome may seem a bit "noob", but it's about more than simply being able to set the BPM (beats per minute) and press "start". It's about getting the most out of your metronome as a practice aid so you can become a better musician. There are two main functions a metronome serves. Its primary function is to help you keep time and improve your timing. Its secondary function is to increase your speed. Without good timing, speed will lose all its grace. If you own a smart phone or tablet, you can get metronome apps for your device. Whether strumming or picking, you can use a metronome to help you improve the accuracy of your timing. Good music isn't just about playing all the right notes in the right order! First, before you work on your timing, you need to know what you want to play. This could be a lick or strumming pattern you've heard or have come up with yourself. Start with the notes/chords and just play them out as they come. You ideally need to know the tune by heart before you work on the timing, so you're only focusing on one thing at a time. If it's a solo piece, break it up into short note sequences and work on each one individually. Once the sequence of notes/chords is memorised, set your metronome to 60 BPM (you can always slow it down if needs be). In the audio below you'll hear an 8 beat/click intro and then the eighth notes will come in. Many people find it helps to count each beat/click - 1 2 3 4 1 2 3 4 1 2 3 4 1 2 3 4 etc. with each group of four being a measure or bar. This is known as 4/4 or common time - the most commonly used timing in rock and pop. For example, here I play a simple, repeating lead sequence using eighth notes at 60 BPM. Tip: if you're writing a new lick, try starting it before the first beat of the measure (e.g. the last & before 1) for a more natural "lead in" effect. The aim at first is to "lock in" to that timing is closely as you can, ensuring the notes "inbetween" the beats (the &'s) are spaced correctly. It's just as important to be accurate at slow tempos as it is quicker tempos. These are the basic timing ingredients in most songs. They're called note values (whole, half, quarter, eighth notes). So do experiment with holding notes like this, starting and ending off the beat (on the &). 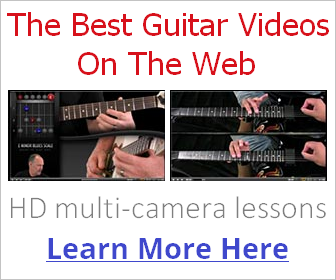 There is another commonly used note value we've left out - sixteenth notes - but we'll come to that. Being aware of the different note values that make up a solo, lick or pattern will make your metronome practice more productive.and efficient in terms of developing accurate timing. There are other timing elements to know about, such as different time signatures (e.g. 3/4, 3/3), stops, triplets, syncopation, shuffle notes etc. and I'm working on a course that will take you through all these elements. But for now, just focus on getting to know these core note values using your metronome. An error many guitarists make when trying to play fast is they increase the metronome too much, too soon. They don't give their fingers the chance to grow in to the lick or pattern. Start off as slow as you find comfortable (40-60 BPM is the standard) and, when you're happy with your performance at that tempo, notch up the metronome by just 10 BPM, no more, no less. The significance of using increments of 10 is that it's subtle enough to not throw you off, yet big enough that it won't take long until you're at 100, 140, 180 BPM. Consistent, incremental changes are the key to building speed with metronome. The Sixteenth Note "Roll Back"
As mentioned earlier, sixteenth notes can come into play once we reach a fast tempo with eighth notes (aim for around 240 BPM with eighth notes). As we're now cramming double the number of notes between each beat, it won't be long before it gets really challenging. Initially aim for 120 BPM using sixteenth notes. That's a solid pace for picking. Throw in some legato and you'll be able to push it to 160 even 180. So the "secret" to playing really fast like these shredders is to roll the metronome back to where you started with eighth notes and follow the same "rule of 10" with sixteenths. This means you'll be able to play confidently and accurately using both eighth and sixteenth notes. While the above processes were very structured, there's nothing wrong with a bit of freestyle experimentation now and again. Test your knowledge of the scale pattern by setting your metronome at a comfortable tempo and playing randomly around the pattern. Use the note value exercises from earlier and chop and change between them when the feeling takes you. As you do this, try to avoid too much linear movement (e.g. 1 2 3 4 5 6 7 6 5 4 3 2 1). Use string skips and note jumps to make your movements less predictable. This is also a good way to come up with melodic phrases. Use the "rule of 10" to speed up and before you know it you'll be dancing around the scale pattern in very spontaneous and improvised ways. It's also a great way to develop finger dexterity, muscle memory and pick-hand co-ordination. As mentioned earlier, these are only the core metronome practice elements. I'll be expanding on this in the future, but I hope you make the effort to include the metronome in your future practice sessions. It will pay off.